British singer Sir Elton John says he wants to talk with Vladimir Putin, Russia's attitudes towards gay rights as "ridiculous". Human Rights Watch in a report published last year, Russia has not prevented or prosecution for fear of homosexuality and bisexuality mentality of violence, attack is intensifying for minority groups. Sir Elton John said in an interview with the BBC, he'll be glad to talk with Mr Putin, even though he might laugh at me behind my back... and think I am an absolute idiot ". The singing of the singers in princess Diana's funeral at present am in Ukraine, he told the BBC that he determined to use her influence to change something. 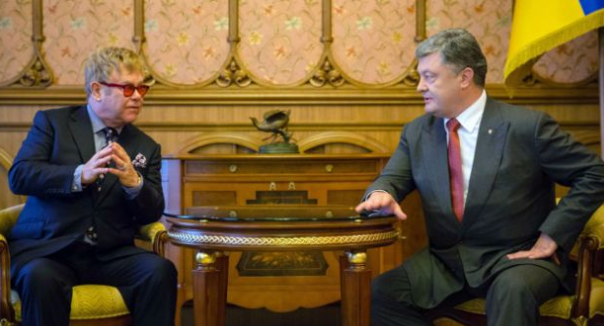 Met with Ukrainian President Petro Poroshenko, and called for the country to give lesbian, gay, bisexual and transgender (LGBT) community more support. Sir Elton was met with a number of business leaders, calling for them not to refuse to hire employees of the LGBT community. Neighboring Russia and Ukraine in June 2013, pass a law for promotion to minors to encourage private gay and bisexual behavior of the individual will make a prosecution. It also makes the bisexual and gay become more difficult, they meet bisexual people have less opportunity. Sir Elton John on the move, and last year Mr Putin alluding to bisexual persons criticism aimed at children's comments. "Don't pull," Sir Elton John said, "you are the President of Russia, and you have to say something so stupid?" "I really want to meet him, sit down and talk with him," he told BBC in Kiev diplomatic correspondent Bridget Kendall interview. He will say to Mr Putin? "Bisexual people is not the problem. How to meet bisexual people? treat bisexual people don't reject and biased. This is ridiculous." "He might be laughing at me behind my back after close the door, and said I am an absolute idiot, but at least I can think of me as a conscience, I also tried."